I found them on offer at a tiny bar in Camogli as part of their Apperitivo (a sort of happy hour in Italy). The blossoms were stuffed with ricotta and basil, lightly battered and fried. Heaven. Another favorite Apperitivo 'small bite' we discovered in Camogli was a tiny delicate omelet prepared simply with fresh herbs and Parmigiano Reggiano. This frittata recipe is my effort at recreating some of the flavours of our Italian vacation at home. Grease 6 inch baking dish generously with olive oil. Chop mint leaves and green onions and stir into ricotta. 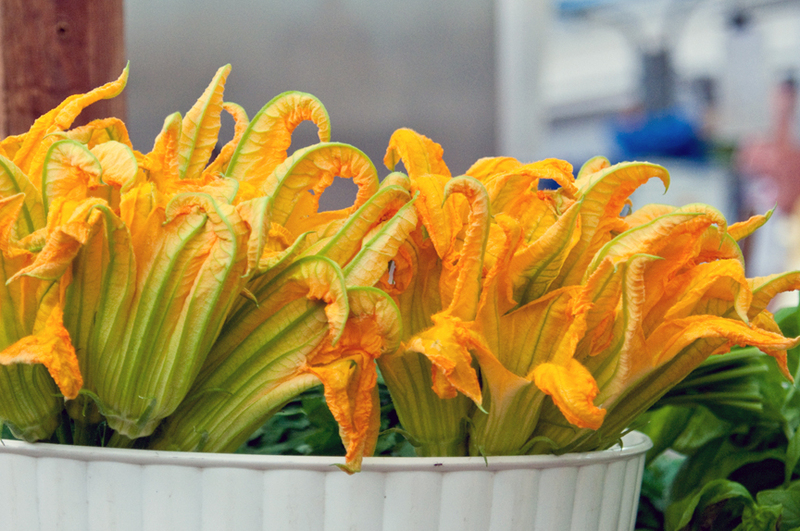 Remove the stamen from the center of the flowers, and gently spread open the petals to allow for the cheese filling. A piping bag is the best tool for stuffing the ricotta into flowers, no muss no fuss. You can always use a small plastic baggie with the corner snipped off, as well. Pipe about a quarter of your cheese mixture into each flower. Arrange stuffed blossoms in the bottom of your greased baking dish. Whisk together lightly eggs and half of the grated parm and pour over the stuffed blossoms. Sprinkle remaining parm over top of the frittata. Place your baking dish on the tray in the hot oven, and bake until golden and puffy, about 15 minutes.